The Federal Highway Administration (FHWA) mandated utilizing the Load and Resistance Factor Design (LRFD) approach for all new bridges initiated in the United States after October 1, 2007. As a result, there has been a progressive move among state Departments of Transportation (DOTs) toward an increased use of the LRFD in geotechnical design practices. For the above reasons, the Iowa Highway Research Board (IHRB) sponsored three research projects: TR-573, TR-583 and TR-584. The research information is summarized in the project web site (http://srg.cce.iastate.edu/lrfd/). Three of four reports have now been published. Report volume I by Roling et al. (2010) described the development of a user-friendly and electronic database (PILOT). Report volume II by Ng et al. (2011) summarized the 10 full-scale field tests conducted throughout Iowaand data analyses. This third volume presents the development of regionally calibrated LRFD resistance factors for bridge pile foundations in Iowa based on reliability theory, focusing on the strength limit states and incorporating the construction control aspects and soil setup into the design process. The calibration framework was selected to follow the guidelines provided by the American Association of State Highway and Transportation Officials (AASHTO), taking into consideration the current local practices. The resistance factors were developed for general and in-house static analysis methods used for the design of pile foundations as well as for dynamic analysis methods and dynamic formulas used for construction control. 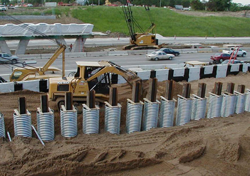 The following notable benefits to the bridge foundation design were attained in this project: 1) comprehensive design tables and charts were developed to facilitate the implementation of the LRFD approach, ensuring uniform reliability and consistency in the design and construction processes of bridge pile foundations; 2) the results showed a substantial gain in the factored capacity compared to the 2008 AASHTO-LRFD recommendations; and 3) contribution to the existing knowledge, thereby advancing the foundation design and construction practices in Iowa and the nation.